There are 2 friends of mine, high school gal pals who have both been wanting to visit Hampi for a while now.. Infact they were talking about the place far more than me, and it so happened i got the opportunity to travel and experience a wee bit of what Hampi has to offer. I sure hope they make the trip before the year ends! While in Hampi, i did manage to cross over to Anegundi and explore a few sights there as well. Going by the Coracle on the river was quite an experience in itself. I dint know swimming, water was flowing quite to the brim and the coracle looked near flat, and had people sitting across every square inch of space. But thankfully, the fear left me before reading the shore, which is what had me relaxed and looking forward to discovering some of the hidden treasures there..
After a hot cup of tea in a small tea shop run by a woman, i hopped into an auto, and went over to a few sights suggested by the auto driver. Enroute, there was so much greenery, it was such a pleasant journey, making me forget the blazing heat for a few moments..
All this work is taking a toll on my Blog!! I've not blogged a travel story since the last .. well the last one!! Hopefully next week should be better..
A few years ago [Aug 2004], while i was working with a Friend, we decided to take a break and getaway for a weekend.. We were 4 girls and were headed to the hills. If you've been to Chennai or lived here, you know how hot it can get! We were heading over to Yelagiri Hills, about 240kms from Chennai.. A train journey till Jolarpettai and then a short ride across the 14 hairpin bends in the cab that had been sent by the Resort, well it was more of a hometstay. And back in the days, Yelagiri was pristine, unspoilt, people barely knew of its existence, plus there was nothing much to do, unlike Munnar or Yercaud! 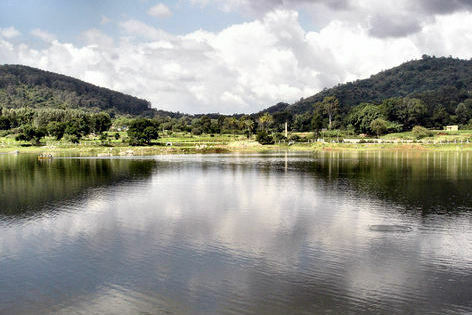 Almost everyday, we would walk past the Punganur Lake, which was a man made lake spread across 57 sq meters. There was a beautiful garden, a play area for children and there was boating offered at the lake. Walking around the perimeter took about an hour, and it was one of the most scenic spots in Yelagiri. On our final day, we did spend an hour boating, with our boatman giving us tales about the place, and also spotted a water snake whiz past our boat... What an experience that was!! We stayed at the Taj Gardens[no connection to the Taj group of hotels], a family run farmhouse owned by one Mr.Rahman, a retired Leather Businessman. The resort wass spread about 40 acres or more, most of which was barren, but the area near the rooms and entrance was done up very neatly with beautiful garden, play area and even a small pool. area of course is large, with huge playground, park, plantations, rose garden, etc. The Vidyashankara temple at Sringeri was built in memory of Guru Vidyashankara or Vidyathirtha by Vidyaranya, with the aid of the Vijayanagar rulers in the 14th century. The golden image of Sarada was also installed then at the Sarada temple. The temple also houses ruby images of Venugopala and Srinivasa and a Nandi made out of a large pearl. Several inscriptions are seen in the temple, describing contributions made by the Vijayanagar emperors. This temple combines the Hoysala and Dravida architectural features. It stands on a richly sculptured basement. There are six doorways leading into the temple. The twelve pillars in the mandapam are named the Raasi pillars, and are so arranged that the sun's rays fall on each of them, in the order of the solar months.